Do you have a plumbing violation from the New York City Department of Buildings? You got questions, I’ve got answers. I’ve done 100‘s of VIOLATIONS. 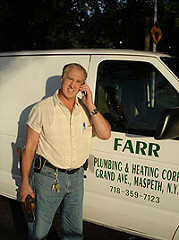 All work is personally supervised by John Farr, owner. Serving all 5 boroughs of New York City. 10% discount for senior citizens.